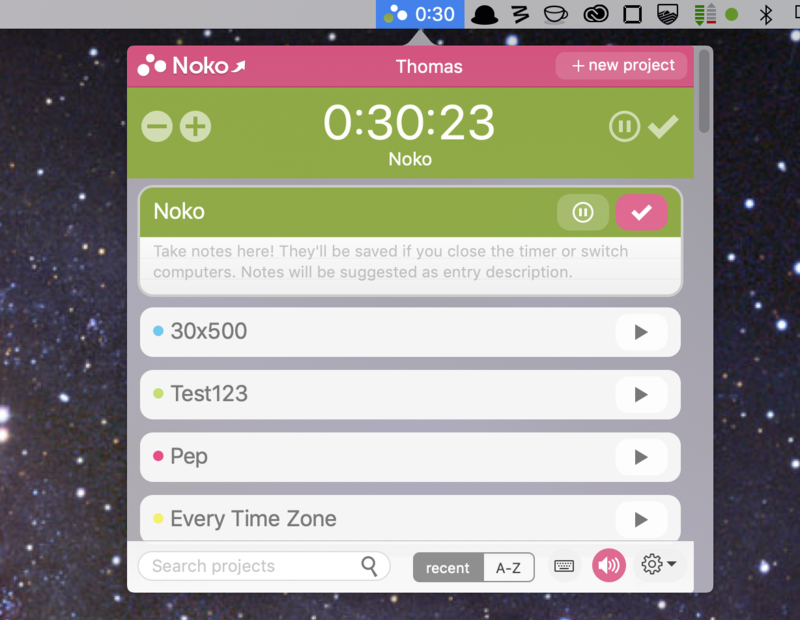 The Noko macOS App gives you access to all the same timers as the web app and the mobile app. And the best part is, the Noko Mac App is free to download from the Mac App Store! After installing and starting the Noko Mac App you'll see a Noko icon in your menu bar. When a timer is running, the Noko icon will show the color of your project moving throughout the icon. When a timer is paused the Noko icon will be black. 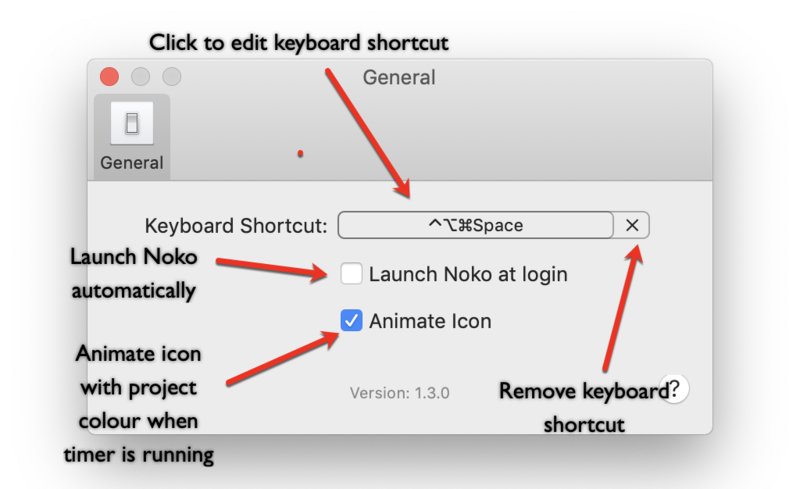 Use the default keyboard shortcut ⌃⌥⌘Space (that's the three keys to the left of the spacebar plus the spacebar itself) to open the Noko Mac App or click the tiny Noko icon on your menubar. To get started selecting a project, scroll to a project and click it it, or just use the arrow keys and then the Return key to start a timer. Use the keyboard shortcut / to focus the project search field on the bottom left then type a search term to filter for projects. Plus, you can view all keyboard shortcuts with a keyboard shortcut! Just type ⇧/ to pull up the list of Timer keyboard shortcuts. That's so meta! On the bottom right of the Noko Mac App you'll see a small cogwheel icon. Clicking this opens a context menu, which allows you to reload the app, sign out of Noko, open Noko in a browser, quit the app and most importantly set your preferences. In the Preferences dialog you can change the default keyboard shortcut that you use to open your Noko Mac App to anything you want. You can also choose to automatically start the Noko Mac App to when you restart your computer (we highly recommend this so Noko is always available to you!). If you don't like the animated icon when a timer is running, you can turn it off (it defaults to on as the animation will remind you that the timer is running!). Quit the app if it is running. (If you can't see the app window, click on the icon in the menubar. Then click the cogwheel icon and then on Quit Noko). In the Finder, go to the Applications folder. Drag Noko into your Trash. Please note: The Noko macOS Menubar App requires macOS 10.8 or higher and a 64-bit processor (that's all new Apple computers since about 2010).